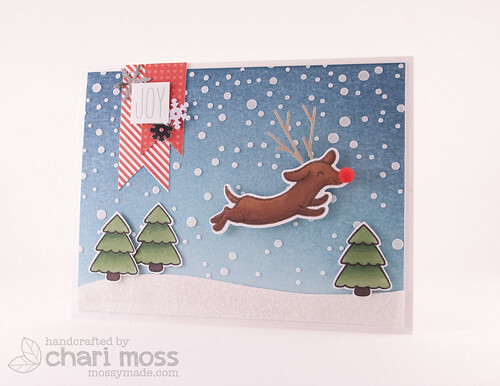 Today I have a fun card using one of my favorite Lawn Fawn stamps. In my house this stamp is Penny of course, so I had to dress her up for Christmas! Little Penny dressed up as Rudolph, how fun is that? I created the background with distress inks on distress watercolor paper then used the falling snow stencil from Simon Says Stamp along with some Glitter snow paste. The ground is covered in Distress Rock Candy glitter. I used the small forest tree die for my antlers and a red pom pom I picked up at my local craft store for the nose. This card makes me smile, I may have to make a new ornament for my tree like this. hehe. This card is so adorable it makes my teeth ache from smiling. Oh, I love this card! Perfect Penny! So, so adorable!! I love these Penny cards! Perhaps there will be a series?? he he he... this made me laugh! Love the red nose! I know I am late bute this card is so darn cute! 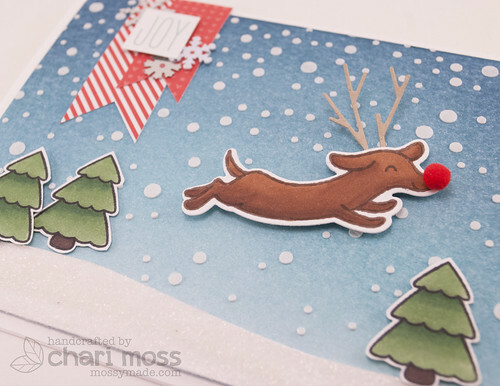 A dachs hund as a reindeer - what a fun idea! I wish you and your family a veryhappy and wonderful christmas!